This 1894 directory listing for the village of Danbury shows George Musgrove at a property named " The Lo" in Horne Row, Danbury Common. We now know this house was named "The Lodge" and is shown on the Electors Register for 1894 below. 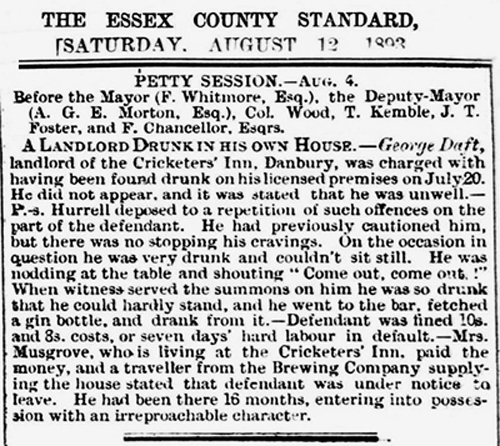 The newspaper story on the right dates from August 1893 and deals with a drunken incident at the Cricketers Inn. The landlord was a man named George Daft. The report mentions that Mrs Musgrove paid the fine and the cost. The article also states that Mrs Musgrove was living at the Cricketers Inn. Exactly why she wasn't living across the road at The Lodge with her husband and children is not known.